This documentation describes how to safely back up your wallet file for safe storage in case your computer or laptop is damaged or lost. Axe Core stores all data necessary to control your Axe addresses in a single file called wallet.dat. This wallet is in the Berkeley DB format and stores the pairs of private/public cryptographic keys used to manage your balances on the Axe blockchain. Axe Core makes most of these operations transparent and even generates automatic backups of your wallet file in case it is corrupted, but the user is responsible for ensuring that these backups are stored in a safe place. If you lose access to your wallet file, you will permanently lose access to your Axe. It is important to consider that if you have not encrypted your wallet using the Settings > Encrypt Wallet menu item, anyone with access to the backed up wallet.dat file will immediately have full access to your Axe. If you do choose to encrypt your wallet, do not store the password in the same place as the wallet.dat file, particularly if you are saving the backup to the cloud. Firstly, never copy your wallet.dat file while Axe Core is open. Always use the File > Backup Wallet menu if the wallet is open. When you select this menu item, a dialog box will appear to specify where the file should be saved. Enter a name for the file, select a location and click Save. The example below shows saving the file to a USB stick. Keep this file in a physically separate location to your computer. 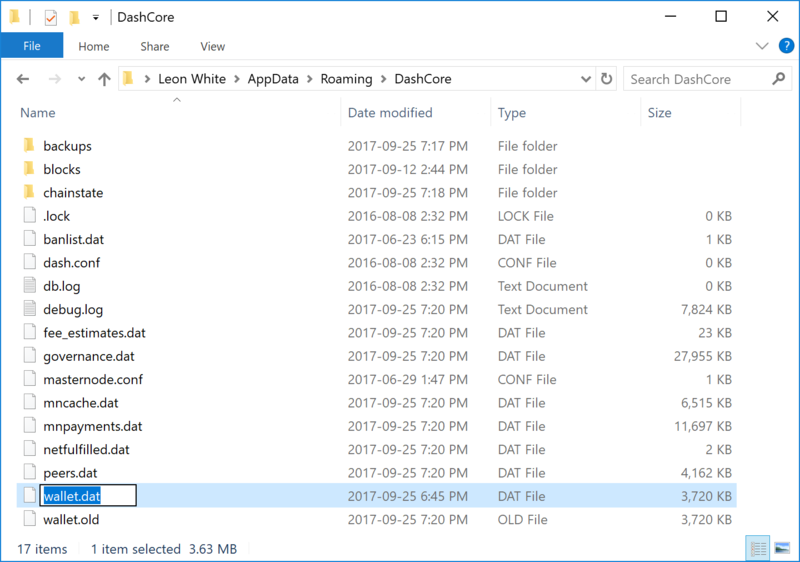 Ensure Axe Core is not running, then simply copy the wallet.dat file from this folder to another folder in the normal way for your operating system. The example below shows copying the file to a USB stick using simple drag and drop while holding down Ctrl on a Windows system. On most operating systems, you can also right click on the file and select Copy, then select Paste in the target folder. Keep this file in a physically separate location to your computer. Be careful to copy (not move) the file! Every time you open Axe Core, it will automatically create a backup copy of wallet.dat in the axecore/backups folder. Up to 10 backups can be kept here by default, and the oldest backup will be deleted as each additional new backup is created. You can modify the number of backups kept here using the -createwalletbackups=n parameter at the command line or in axe.conf. Setting this value to 0 completely disables backups. 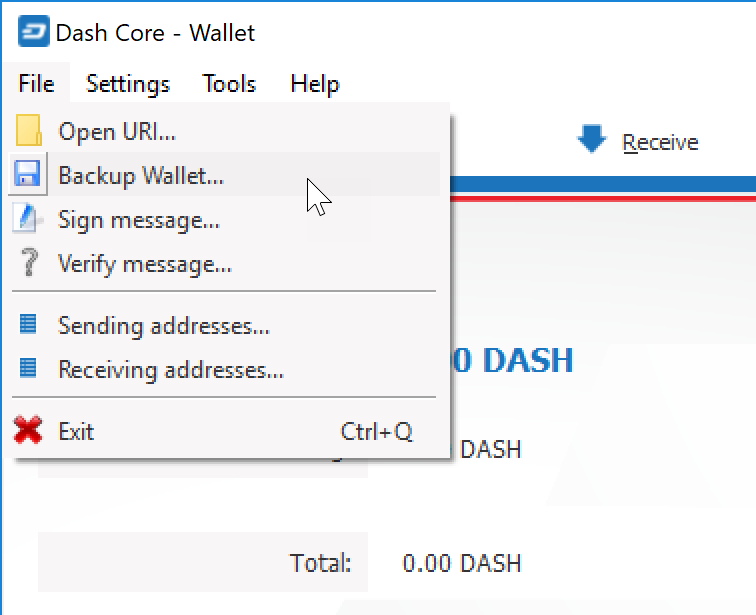 You can view the automatic backups folder by browsing to AxeCore folder at the location specified above for wallet.dat and opening the backups folder, or by selecting Tools > Show Automatic Backups from the menu in Axe Core. Since these files are not active when Axe Core is running, you can safely copy them at any time. They are also a handy backup if the original files in the AxeCore folder become corrupted due to improper shutdown of the Axe Core app. 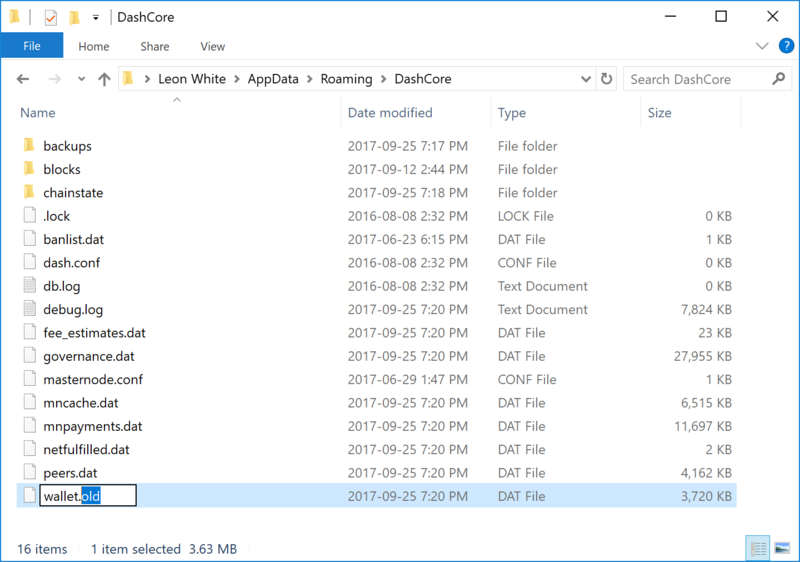 To restore a backup, install Axe Core on the target system (or stop it, if already installed) and rename the existing wallet.dat file in the AxeCore folder. Then copy the backup wallet file to the AxeCore folder and ensure it is named wallet.dat. Now, when you start Axe Core again, it will load the new wallet. Do not replace wallet.dat while Axe Core is running, since this will result in data corruption! Any backup depends to some extent on the existence of software capable of reading the data at some future point in time. As such, it is good practice to store a copy of the software used to create the backup together with the backup file itself. In this case, this would be a copy of the version of Axe Core you used to create the backup. The wallet.dat file itself should be encrypted using a password set from the Settings > Encrypt Wallet menu item. However, this only prevents someone with access to the file from creating transactions, not from opening the file. 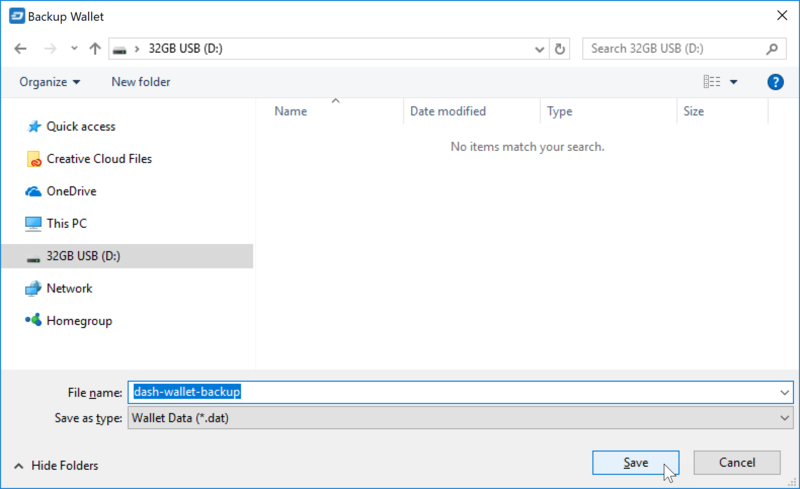 You could additionally store the file in another encrypted container, such as a USB stick using BitLocker in Windows, LUKS in Linux or FileVault on macOS. It is also possible to create disk images or zip files with password encryption - the choice is yours. For further reading on encrypted containers, see here. Where you store this file is then up to you. It could be in your home, in a safe deposit box at a bank, a waterproof or fireproof container, or on cloud storage such as Google Drive, Dropbox or iCloud. Consider where you will store any passwords needed to restore access to the wallet (in your head, on paper, in a password manager, etc.) and who may need access to the password in the future. Finally it is important to understand that wallet.dat itself is a relatively dangerous way to store large amounts of funds - it is simply a database file storing private keys. While the convenience of storing a wallet file directly is fine for smaller holdings, it is more secure to to store large amounts of Axe on a single predefined address in a way that you are guaranteed access through any software supporting the protocol, rather than a specific implementation of that protocol. If you are interested in this, read more about paper wallets, where the private key can be printed directly or also encrypted using BIP38 for safe storage. There is no fixed procedure to verify your backup, but you should test restoring it at least once to make sure it works. If you have a simple copy of the file, try to restore it to your current AxeCore folder and start Axe Core to make sure it opens without any errors. If you decided to store the file in an encrypted zip file, make sure you can unzip it and that it opens correctly in Axe Core. In short, make sure that you (or the person you are trusting to eventually go through this process for you) can actually reverse your backup process to get access to your Axe, instead of relying on the fact that this process should theoretically be reversible.